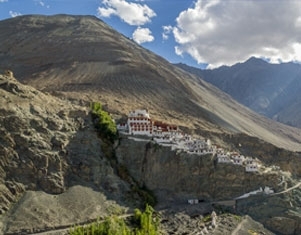 Ladakh’s precious possession, its biggest town Leh, is a traveler’s delight. It is also known as “Land of High Passes” and is mainly inhabited by Tibetans. With long stretches of beige hills and almost null vegetation; Ladakh looks beautiful with its cragginess too. While you drift across its roads, you will pass past iconic monasteries and stupas. After reaching Leh airport (on your own), you will be greeted by our representative and transferred to the hotel for check-in. Spend the day in the hotel for rest and acclimatization. Overnight stay in Leh. After breakfast, proceed for sightseeing on the Leh – Srinagar Highway. Visit the Hall of Fame (A Museum developed by the Indian Army), Kali Mata Temple &GurudwaraPatthar Sahib (A Gurudwara constructed & maintained by the Indian Army). Proceed further and experience the effects of Magnetic Hill (Defiance of the law of gravity wherein a vehicle starts climbing up the hill when put in a neutral position) and admire the confluence of holy Indus &Zanskar. Return back to Leh for an overnight stay. After breakfast, drive to Nubra Valley (Known as the Valley of Flowers and the warmest region in Ladakh) via Khardungla pass. This road is one of the highest motorableroad in the world. After spending some time at Khardungla, proceed to Nubra. Visit Sand Dunes in the evening and enjoy the double humped camel ride (on your own). Overnight stay in Nubra. After breakfast, travel back to Leh. En route take a short halt at Changla Pass to enjoy a cup of hot steaming tea. Visit Hemis Monastery, Thiksey Monastery, Rancho School, Shey palace and SindhuGhat on the way. Visit Shanti Stupa &Leh Market in the evening. Overnight stay in Leh. After breakfast, get transferred to Leh Airport for boarding the flight to your destination. Tour Concludes with some wonderful long-lasting memories.